Riblets are the top piece of baby back ribs, often separated from the larger, more familiar cut to give it a symmetrical look. They're a bit on the tough side, but they have a pronounced pork rib flavor. By applying a dry rub and steaming riblets in the oven, you can turn out tender bite-size rib meat that falls off the bone. As with baby back ribs or spareribs, you can serve riblets with just the rub or finish them with a sauce or glaze. 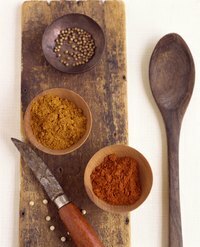 Make your own dry rub if you don't have a store-bought product you want to use. Mix equal parts paprika and dry mustard powder as a base, and add brown sugar, salt and freshly cracked black pepper, onion and garlic powder, celery seed and your favorite spicy chili pepper powder, to taste. Pat the dry rub over the surface area of the pork riblets. Place the pieces in a roasting pan and cover it with aluminum foil. Refrigerate the coated meat for at least one hour, but preferably longer -- up to 24 hours. Preheat the oven to 325 degrees Fahrenheit about 20 minutes before cooking. As the end of this time approaches, bring about 1 cup of water to a boil over high heat in a small saucepan. Open the foil covering the riblets and pour the boiling water into the roasting pan. Don't pour water directly over any riblets, however, as it will rinse off the rub. Seal the foil over the pan again and put it into the middle of the oven. Cook the riblets for about 1 hour, until the meat is very tender and separates easily from the bone. If you make a glaze for your riblets, apply it for about the last 10 to 15 minutes of cooking time; leave the roasting pan uncovered for the remaining time.